Experian recently released its “State of Credit: 2017” report, which outlines the average credit scores, spending habits and non-mortgage and mortgage debt levels of Americans. Overall, Experian says the higher average credit scores (674) and higher consumer debt loads ($24,706) are a cause for “optimism and caution,” and that’s certainly true when it comes to the amount of mortgage debt buyers are taking on. In 2017, the national average mortgage debt was $201,811 — a three percent year-over-year increase from 2016 and a 9.49 percent increase from 2007. The increase is due, in part, to millennials finally jumping into the housing market after years of staying at home with their parents to save or pay off student loan debt. In 2017, the average millennial homebuyer had an average mortgage debt of $198,302 — a 6.8 percentage point increase from 2016 ($185,668). On the other hand, Experian says the rise in mortgage debt also reflects the skyrocketing home prices buyers have been grappling with over the past few years. In December, home prices rose 5.8 percent (the 70th consecutive month of year-over-year gains) and for-sale inventory dipped a whopping 11.4 percent to the lowest level since 1999 — the perfect recipe for record-breaking home price growth and mounting mortgage debt for buyers. 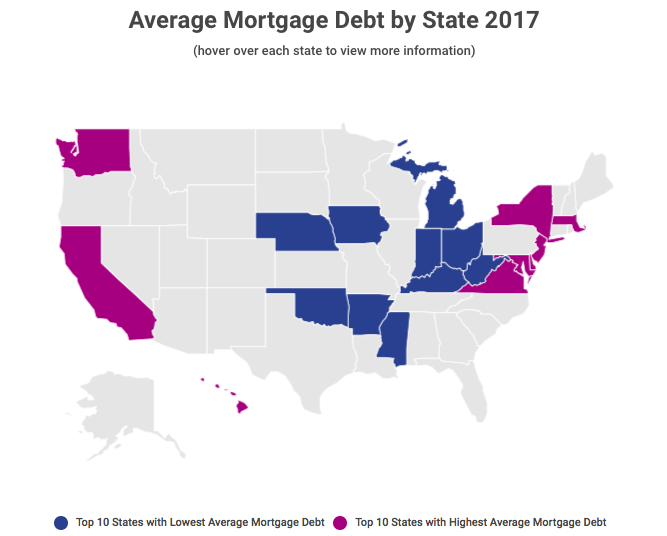 The report also examined mortgage debt levels on a state-by-state basis, which also reflects the overall housing conditions in those states during the past year. Southern and Midwestern states have the lowest mortgage debt rates and home prices compared to their coastal neighbors, where $1,000,000 neighborhoods have become the norm. On the state level, homeowners in Washington, D.C. had the highest level of mortgage debt for the second consecutive year, topping out at $406,035. California and Hawaii rounded out the top three at $347,652 and $342,613, respectively. Meanwhile, homeowners in West Virginia had the lowest amount of mortgage debt at $114,583. Mississippi and Indiana had the next lowest amounts of debt, ranging from $120,000 to $122,000. In terms of year-over-year mortgage debt growth, North Dakota had the highest increase at a staggering 40.66 percent. Texas (+23.85 percent), Washington D.C. (+17.42 percent), Oklahoma (+17.28 percent) and Wyoming (+16.72 percent) rounded out the top five. 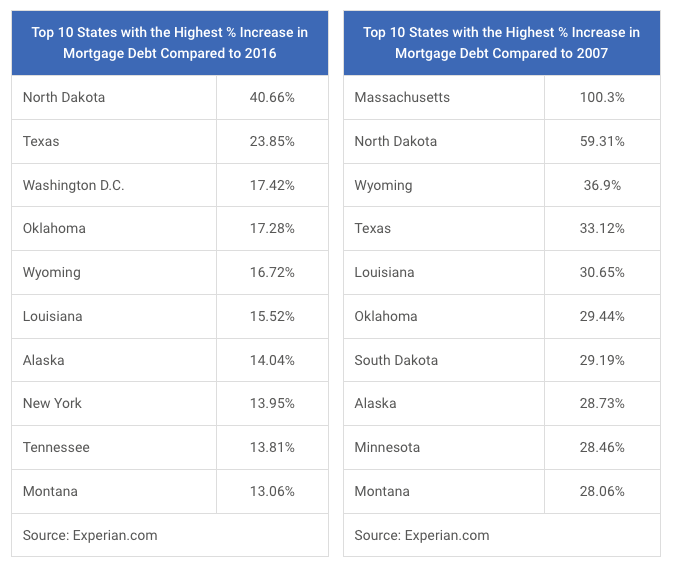 When it comes to mortgage debt growth since the recession, Massachusetts experienced a 100.3 percent growth — nearly double the rate of North Dakota (+59.31 percent). Wyoming, Texas and Louisiana rounded out the top five with 36.9 percent, 33.12 percent and 30.65 percent increases, respectively. Meanwhile, Nevada, Arizona, Wisconsin, Illinois and New Mexico had the lowest year-over-year increases of mortgage debt, with the debt actually decreasing by 6.07 percent in Nevada and 3.02 percent in Arizona. 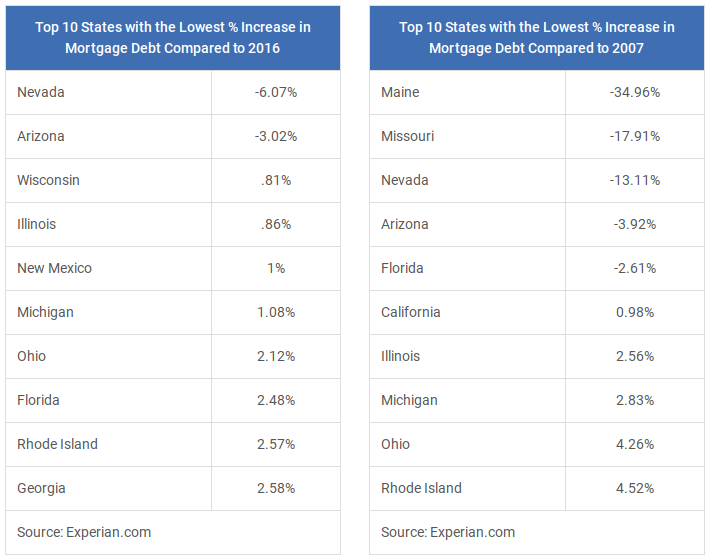 Maine, Missouri, Nevada, Arizona and Florida had the biggest decreases in mortgage debt since 2007, ranging from -34.96 percent to -2.61 percent.